Conference Materials - Flottman Company. 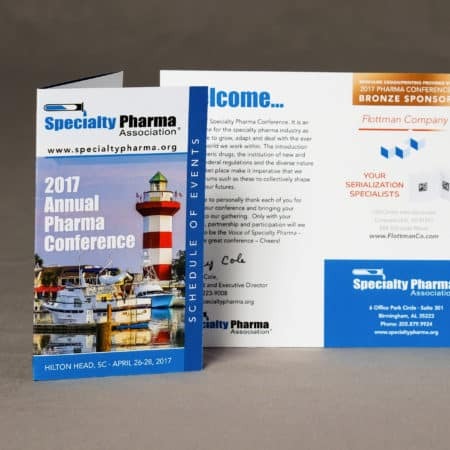 Create a conference materials for the Specialty Pharma Association (SPA)’s annual conference that communicated conference information clearly and also promoted our serialization capabilities. Co-brand conference materials with SPA and our own information. The materials were a hit with conference attendees, and proved useful throughout the event. Check out these photos of the materials in use. 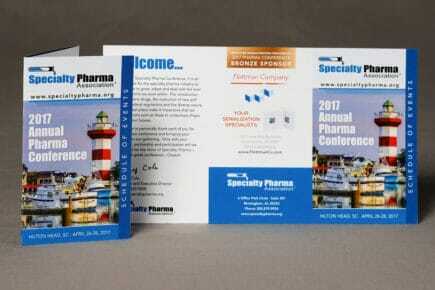 Flottman Company designed and printed the conference materials for Specialty Pharma Association’s 2017 Annual Pharma Conference. The event materials included an official brochure with the schedule of events, as well as a note pad and handouts for our company representatives’ use at the event. We designed all of the materials to be easy to use and understand. The tri-fold brochure is a great example of our commercial folded printing skills. The piece was designed, printed, cut and folded in house, which allows for a more streamlined and simple production process. A folded brochure was the perfect way to condense the packed conference schedule into an easily transportable and pocketable item. The small size of the brochure allowed attendees to have the schedule of events easily on hand throughout the length of the conference. As the conference’s offical printing provider, we were able to co-brand the printed materials with our information as well. Flottman Company printed and folded the event schedule for the conference. This project also included our personal materials handed out by our company representatives at the conference. The first piece was a pad of paper branded with the SPA and Flottman Company logos, along with our company information. The other two pieces were handouts that focused on our ability to help pharmaceutical companies serialize their products. This conference took place soon before the 2018 institution of required serialization for all pharmaceuticals. We took this opportunity to promote our ability to help companies meet these requirements. The first handout was a postcard-sized piece advertising our serialization abilities, with some details on our machines that give us these capabilities. The second was a larger sheet that had more in-depth information about our services related to serialization. Overall, these conference materials allowed for a successful event, both for Specialty Pharma Association and Flottman Company. Are you in need of conference materials or another commercial folded printing project? Request a quote today!